So ya, thought ya, might like to go to the show. To feel the warm thrill of confusion, that space cadet glow. The first time I listened to Pink Floyd was in 2009, when a friend gave me Dark Side of the Moon. For awhile, Dark Side was the only Floyd album I listened to – but in the three years since I have really grown to appreciate the band. There was Wish You Were Here in ’75, Animals in ’77, and then The Wall in ’79. 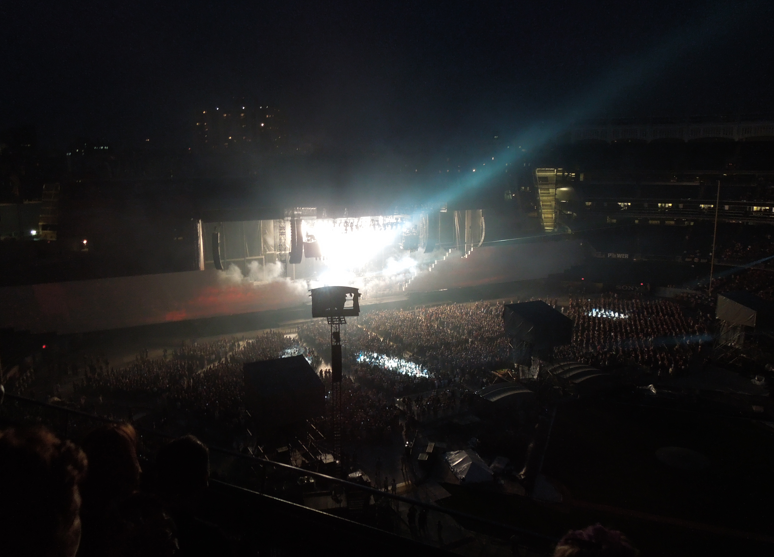 So when I saw that Roger Waters was playing a show at Yankee Stadium, I knew I had to go. One of the things that attracted me to the band was the way the albums were constructed and the issues they dealt with – greed, time, isolation, and growing up. The music was a nice foil to the harder rock that Zeppelin and The Who produced around the same time. The Wall is not my favorite Floyd album (Dark Side) and it does not contain my favorite Floyd song (Wish You Were Here), but it was the longest, most theatrical album they ever created. The concert was last night, and it was quite the spectacle. It was the first true rock concert I have ever attended, and it was by far the largest, so I don’t have much to compare it to. At times, it seemed more like a Broadway show more than anything else. The venue at Yankee Stadium made it all the more better – and it was also bizarre to see the Stadium set up for a rock show. All in all, it was a great night, and I am glad that I was able to see the show. Waters has said that this is probably his last tour, which is one of the reasons I wanted to see his stop in New York. Obviously, I didn’t get a chance to see concerts in the ’60’s and ’70’s, so it’s important for me to see all these guys before it’s too late.